Goodbye, Izzy Dearest. What Now? 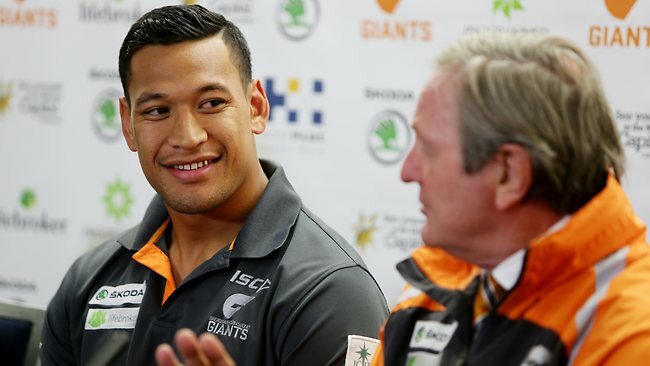 Just like we all expected from the very beginning, Israel Folau has returned to the NRL. Ah, all is right with the world. But I am pretty bummed about it. While I never gave my actually opinion in my evaluation if Izzy’s AFL “career” (can you call it a career if it only lasts a year?) my opinion was this: he was useless on the field, but he was great off of it. While I alluded to the fact that his presence may have contributed to attendance, thereby increasing ticket sales and revenues, there isn’t really a way of measuring the number of people who came for the sole purpose of seeing Israel Folau play. One thing is for sure: he was a fan favourite. Remarkably. How do I know? 72% of jerseys sold were his number 4. That’s a ridiculously high percentage. Kobe Bryant doesn’t even pull those kinds of numbers (I’m guessing – but the other Lakers are way famous, too so I just assume). Now… things are different. I am not going to slam Israel Folau (because I don’t have a problem with him) and I’m not going to be rude, crude and socially unattractive by calling him a disaster, because I don’t think it was – the Roar gives a pretty good explanation as to why. But with Izzy leaving, a lot changes for GWS. Like what, you may ask? Well, allow me to tell you. Especially now that they’ve got enough room in their salary cap for a big name. Word on the web is that they might try and woo Kurt Tippett. But I’m keeping my fingers crossed that they don’t. I would be unhappy and we all know that GWS lives to make me happy (No? They don’t? Are you sure?). Still. What would he even do there? GET IN THE WAY, THAT’S WHAT. Those are just the basic things that will change: economical, political and social, in the broad sense of the words, of course. I’d love to hear some thoughts – what do you think GWS will need to focus on now that Izzy is gone? Am I completely off base in saying these things will be a concern? If so, what do you think, if anything, will change for GWS? ← Best Of The Week: 3 November 2012.